Sixteen-year-old Ellie comes from a family of farmers, but her father, her only living parent, does not appreciate the art of growing vegetables, or his daughter's interest in growing a pumpkin worthy of first prize in the adult division at the local harvest fair. But Ellie knows that if she doesn't spend as much time as possible helping her pumpkin gain weight, her arch-rival, Cyril Pool, whose integrity is questionable, will win the title instead. Therefore, despite her dad's lack of understanding, Ellie, with the help and support of her grandmother, her cousin Richard and a classmate named Wes for whom she might have romantic feelings, continues to push for her goal, though pumpkin thieves and bad weather threaten her success. This cozy Fall read, which was the author's very first novel, is a quick and satisfying story about an unusual teen girl and the hobby that sets her apart from others in her school and community. Though there is conflict - between Ellie and her dad, between Ellie and Cyril, between Ellie and her feelings about her weight, etc. - there is also a wholesome sense of community and family that gives the book a very uplifting and inspirational feeling. 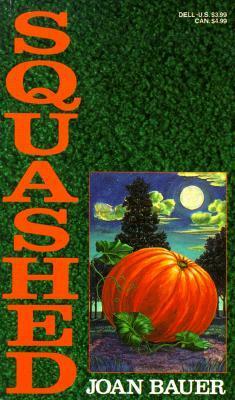 Though the stakes are very low in this story (especially as compared with some of the author's other novels, such as Tell Me, which involves human trafficking, or Soar, where the main character has a serious health problem), the reader is drawn in by the details of what goes into growing an award-worthy pumpkin and easily becomes invested in the question of whether Ellie can take home the prize she so greatly desires. Though this book is aimed at teens, it is most appropriate for middle school readers who can readily relate to Ellie's feelings of awkwardness around her peers and her (albeit mild) resentment of her father's lack of interest in her chosen hobby. From a character-building perspective, it's a great story to show girls how to be comfortable in their own skin (Ellie never does lose the ten pounds she is worried about at the start of the book, for example) and that sticking with a goal even when the odds are stacked against them is its own success, whether they win or lose. This is the fourth Joan Bauer novel I have read, and it has renewed my interest in her writing. I plan to read through the rest of her backlist in the coming months in the hopes of uncovering more uplifting and wholesome stories for tweens and young teens. Ghost is one book full of mysteries I have personally read the book and I was impressed with how the story unfolds keep up the good job Katie.